Hag: An old woman, often a witch. Often, but not always, considered malevolent. 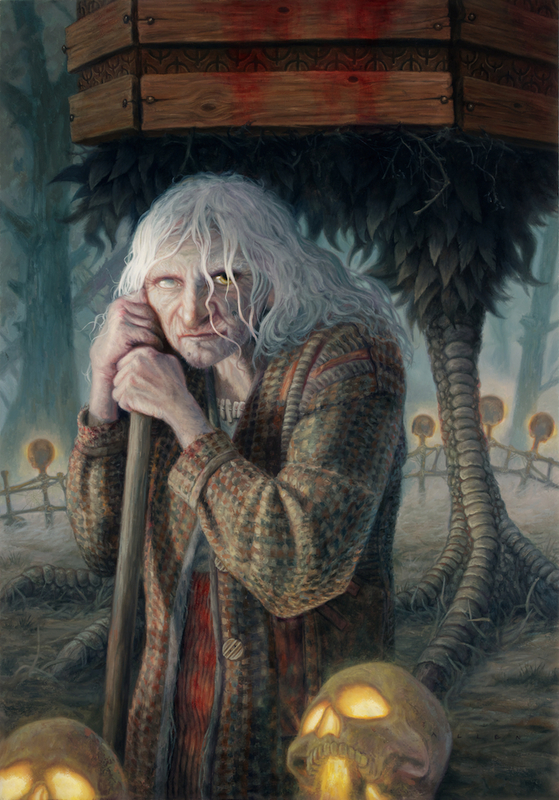 Baba Yaga is a well-known example, coming from Slavic folklore. In Elf Mastery, Eunoe and Aspen have a brief encounter with a hag on the sun. 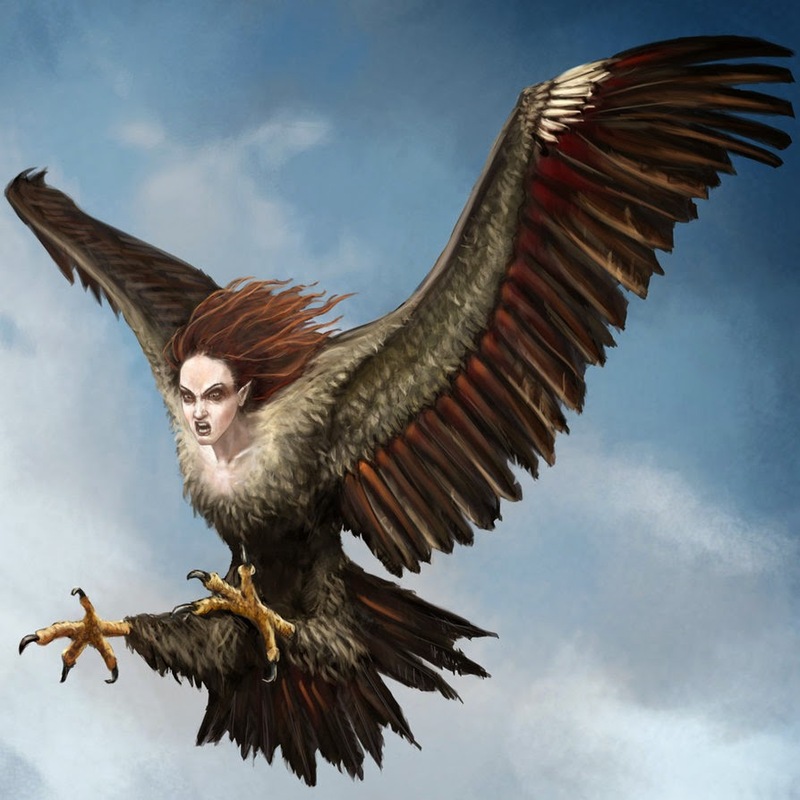 Harpy: In Greek and Roman mythology, a large bird with a human head. Usually depicted as female, and often with a woman's torso instead of only the head. Modern portrayals often depict them with both arms and wings, though older depictions seem to omit the arms. They are usually portrayed as malicious, though in Elf Mastery they are as civilized and varied as any other intelligent creature. Haven: Not mentioned in Elf Mastery, but both High Haven and Haven Hall are named for it. Haven was an independent city-state. During the reign of a particularly terrible Elf tyrant (usually referred to by the uncreative moniker Tyrant King), refugees fled far away to an isolated valley and formed their own community. Realizing the need for growth to defend themselves against the tyrant's armies, they promised to supply food and housing to any soldiers and mercenaries who would come to their aid. Past crimes and misdeeds would be forgiven in exchange for military service. Ogres, orcs, trolls, dwarfs, and all manner of creatures flocked to the site, and the city of Haven was built. It existed in relative peace for several years, until the tyrant deployed an army one spring and burned Haven to the ground. It wasn't for another ten years that Kinsel King rose up and overthrew the tyrant. Years later Haven was rebuilt as High Haven, and appointed the center of rule for the world of Order. Haven Hall: Kyla's dormitory, one of several large fortified barracks that have been converted into residences at Equinox. As the soldiers they were built for were mostly ogres and trolls, the doors and ceilings are rather large for Kyla-sized folk, though much has been re-done to accommodate smaller folk. Though no one is sure who built the structures originally, they were used as Headquarters during the Kildath clan wars, for which the Kildath is named in the Montgrelle Forest. Haven Hall was so named by King Oberon in commemoration of the city-state of Haven, as many of the elves of the region have roots extending back to the reign of the Tyrant King. Heff: A minotaur who works at the center of the earth pushing the wheel the spins the earth on its axis. He was once a great warrior, but due to his age and old injuries he has taken to the life of a laborer. He is the supervisor of his crew of earth elementals, and is one of the rare folk who can understand their language. Helian Shield: (HEE lee un) A barrier made of light and energy which can be raised or lowered around points of importance on the sun. Though usually invisible, it flashes with a bright light when touched. Helios: (HEE lee uss; or HEE lee oss) In Greek mythology, the god of the sun. In Elf Mastery, the capital city on the sun where aqualux is refined so it can be converted into light. High Haven: The Royal City. Built on the ruins of Haven. The military and administrative center for the World of Order, which consists of our solar and star systems. Though King Oberon and Queen Titania are recognized as the absolute rulers, their political power is generally not recognized to extend outside the principles of Order, except within High Haven itself. That is, they are understood not to interfere with conflicts or issues pertaining to other nations unless their input is sought. However, as they have rights over any interference with the principles of Order, they have an informal (but widely acknowledged) intelligence network that permeates all nations in search of global threats. Oberon, Titania, and their messengers are also considered to have travel rights into and out of any other nation's capital, though they usually follow the proper protocols of visiting dignitaries. High Haven is the most populous city in the world, and likely the most ethnically diverse, with communities formed of almost every major race and creature. It is encircled by various enchanted barriers for both defense and intelligence gathering. Highwood: An Elf city. Unlike Kyla's home of Aspengrove, and the general trend in her region of building into the trees, Highwood is constructed of colorful crystal towers. The exact material from which the towers are made is unknown outside the craftsmen who make it. It is magical in nature, and the resulting buildings can only be seen or felt if the Elves allow it. This proves to be a perfect defense, as attackers can siege Highwood only to find themselves standing in an open plain. The name Highwood was taken from the forest where the city was built. However, uncharacteristic of their role as guardians of the forest, the elves of Highwood have long since cleared the woods to allow for more buildings and works of art. This attitude has soured their image in the minds of other elves. Human: The most intelligent of all the animals. Some Animal Designers argue that humans are practically the equivalent of elves, but of course elves take this with great offense. Elves did invent the human, and though the tale changes with every telling, most agree that they are one of the more fascinating animals on earth, and were it not for the great mess they leave, they might be invited to participate in Oberon's world of Order.